New Acropolis Chile is fully involved in the national networks of humanitarian aid, and in this context offers on-going trainings in various specialties. A recent training focused on the putting together of individual and family backpacks prepared as emergency kits, with the essential elements to deal with situations such as an earthquake, tsunami etc. 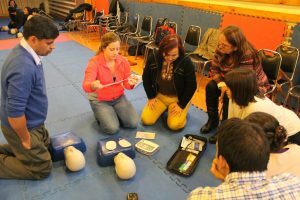 It also offered a workshop on CPR, (cardiopulmonary resuscitation), with the use of puppets, external automatic defibrillator, etc.